I just had the great fortune of working in Brazil for nearly 4 weeks on a project for the FIFA Confederation Cup, which allowed me to travel to Fortaleza (northeast corner of Brazil) and to Rio. This was my first trip to Brazil and it was a privilege to work and play in one of the world’s emerging markets. Brazil is everything you would expect…beautiful beaches, perfect sunsets, warm and friendly people and a colorful spirit from music to artwork. My team and I were welcomed with open arms by the people we worked with and those we had the pleasure of hosting. As a lifelong soccer fan, finding both Copacabana Beach and Ipanema Beach covered with soccer nets was a joy. Sport is a national past time in Brazil and when in doubt, the natives can be found on the beach, wearing as little as possible, playing either footie or beach volleyball. I was not prepared for the significant discrepancies of wealth that haunts the country. You need not travel very far before baring witness to million dollars homes shadowed by the favelas that crawl up the hills. One of the most significant parts of my trip was a tour of the favelas in Rio. I wanted to truly understand the social significance of the favelas and these infamous neighborhoods that pepper every direction you turn. On average, those living in favelas earn no more than $200 per month and everything that can be used to build a house is secured; from banners to garage doors being used as walls. Social services are incredibly limited in favelas; which was a major spark of the recent protests. The government has chosen to build stadiums instead of providing basic social needs to residents. Yet, when you walk through the favelas, there is still very much a Brazilian spirit present. These neighborhoods may house the poorest of the poor financially, but they resonate with the richness and vibrancy that makes Brazil a very unique place. 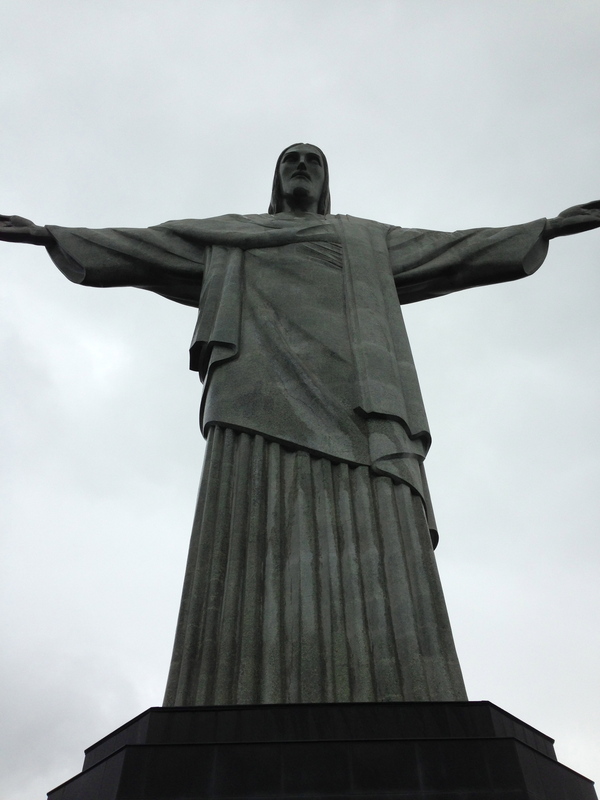 Like every visitor to Rio, I enjoyed a visit to both Sugar Loaf and Christ the Redeemer. The view of Rio from both locations is breathtaking. Standing at the foot of the Christ with my arms spread wide (because that’s of course how you have to have your picture taken!) offered one of those unique moments when you realize that you are seeing one of the great man-made wonders in the world – not through the vessel of a book or tv, but instead with your own eyes. In a word, awesome! Brazil being the soccer-loving country it is, the atmosphere in the stadiums for the matches was electric. One highlight had to be at the final match of the Confederation Cup, which was the game between Brazil and Spain. When the Brazilian national anthem began being played, the entire stadium – all 70,000 yellow shirt wearing fans – began to sing. The patriotism and enthusiasm for both country and sport was electric. I look forward to returning next summer for World Cup so I best start learning more Portuguese!